Ways to reflect the "fog of war"
I occasionally read someone write that "everyone plays video games now". I suppose this is to contrast with "the old days" when video gaming was unusual, and the players felt they were somehow exceptional. But it's the long-time video game fans writing this stuff. Even now, "everyone plays video games" is not even close to true. The Entertainment Software Association's own promotional literature says 68% of US households play video games. That leaves 32% that don't. And that's in the US, still a relatively rich nation where people can "waste" money on game consoles and PCs-for-leisure. Not so many years ago, it made sense to say "half the people in the world have never placed a phone call". They might have talked on the phone after someone else placed the call in some village out in the sticks. I suspect phones are much more common now, but game consoles and PCs are still expensive luxury devices in much of the world. So, while we probably can no longer say "half the people in the world have never placed a phone call", I'd guess that far more than half the people in the world rarely, if ever, play video games. Sorry, more than half isn't anywhere near "everyone". Get a grip on reality, get out of your insular point of view. In any case, some people have an entrepreneurial frame of mind and want to start their own companies rather than work for someone else. Also you may at some time have reason to deal with a small or startup company. At that point it's your duty to yourself to "scout" the company and find out whether they seem to understand their business, or if they're in cloud-cuckoo-land. I have a few observations about starting a company. First, a viable business plan is absolutely necessary. You do not want to just stumble into conducting a business the way you might stumble into playing a game. There is no "save game", no "start over"--if you fail, you're done. Many times, if you diligently research a business plan, you'll find that what you thought was reality, isn't. That may or may not change your mind about starting a company, and certainly may change how you go about it, but it's always better to have the option than to blindly go forth. Even if circumstances change, you can adjust your plan as you go. The most important thing about planning is that it makes you think about what's supposed to happen and where you're trying to go. If you don't know where you're going, how can you ever get there? "Dumb luck" is not a business plan. When you deal with a small or startup company, if they say something like "business plans don't matter because so many things change so quickly" or "business plans don't matter because no plan survives first contact with the enemy", RUN, don't walk, away from them. In effect, they're hoping to fight fires as they arise, rather than engage in fire prevention. They're hoping rather than planning. They're in cloud-cuckoo-land. If the small or startup company you're dealing with says they succeed on "passion" or "hard work", most likely they're hoping to succeed, not planning to succeed. Somehow "a miracle will occur". And you know, occasionally it does--but mostly not. If they tell you they're going to succeed where others have not, because they're so passionate about games and they're going to hustle so much, maybe you should find someone who talks business instead of football pep-talk. Finally, know what business you're in. If you intend to make video games, make sure you behave as though you're in the entertainment business, not the technology business or some other business. There are exceptions, but most of the time video games exist to entertain. See my earlier post "what business are you really in?" I'll be at GenCon for the first time this year. The next two years it is at the same time as WBC, which I prefer for various reasons. And usually it is too close to the start of the college semester (I teach for a living). I'll also be at WBC (World Boardgaming Championships). I'll be offering my talk about getting into professional game design (same as one of the two I do at Origins). I am a contributor to Family Games: the 100 Best, which will be published later this year. I've been asked to contribute to another anthology, a book about non-electronic game design, to be published next year by ETC Press. My book "Get it Done: Designing Games from Start to Finish" is at 115K words. I'm trying to cut it down because the original aim was 100K. Video game developers have created a list of game design tips and maxims called the 400 Project. The original idea was to come up with 400 entries, I think, but the project apparently went dormant in March 2006 at 112. Contributors include some very well-known video game designers. http://www.theinspiracy.com/Current%20Rules%20Master%20List.htm (You can click on the name of this post.) There used to be a downloadable spreadsheet, but I don't see the link now. Some of the entries are more or less repetitions of others, some are specific to video games, but this list is good food for thought, especially if you want to design standard video-games-as-interactive-puzzles. An example I used with computer networking students about "what business you're really in" is the failure of the great railroad companies (Santa Fe, Union Pacific, NY Central, etc.). The great railroad companies dominated late 19th century business; past the middle of the 20th, most were bankrupt. This happened because they thought they were in the railroad business, when they were actually in the *transportation* business. When the transportation business changed (trucks and good roads, airplanes) and railroads became much less important, they lost out. My point to networkers is that they're in the communication business, not the networking business. How does this apply to games? Some video game companies apparently think they're in the technology business, when they're actually in the entertainment business (even the ones making "serious" games will prosper if those games are also entertaining, as for example "America's Army"). I think this can be applied to the Sony vs. Nintendo console competition. Sony thinks technology, Nintendo thinks entertainment (also applies in handhelds, it appears). (And this should have been obvious to Sony, because the *really* good technology, PCs, doesn't make it as a major game platform compared with the whimpy consoles.) As another example, many people called "Crysis" a technology demo, but a poor game. The management of the company decried piracy for a failure to sell the game in expected numbers, but the real reason might be that it wasn't much of a game. To move down one level of complexity, some video game companies think they're in the story-telling business, or even more specifically in the movie-making business, when they're really in the video game business. Video games are not like movies, and stories are not the most important component of most video games. (See http://www.costik.com/gamnstry.html) At one time in the video game industry, film-maker wannabes published "games" that were more cinematics and cut-scenes than games, and that turned out to be a failure. So we see proposals to treat video games, and video game production, the same way films are treated. I think this is a mistake. Every industry finds its own way of doing things. Trying to pretend you're something else is very likely to end badly. This is the difference between saying "we should do such-and-such because that's how the film industry does it", and "the film industry has a different way of doing such-and-such, and we can adapt it this way because it makes sense." If it makes good sense, do it. If it just happens to be how some model does it, forget it. Some people might be interested in the contrasts between video game conferences and non-electronic game conferences. In this case I'm drawing primarily from Origins Game Fair (Columbus, OH) and Triangle Game Conference (TGC) (Raleigh, NC). TGC is a relatively small, new conference, somewhere over 700 attending this inaugural year, but almost all of those people are either industry professionals or students who want to be in the industry. There is virtually no game playing at the conference. Among the 10,000-15,000 at Origins, most are consumers, gamers, although there are plenty of industry professionals. (The variance in attendance reflects the effects of the recession: 15,000 two years ago, 10,000 this year.) Playing games is a big reason for people to attend. At Origins the focus is playing games just for the heck of it, with a few prize tournaments such as the U.S. Yu-Gi-Oh championship. At TGC the focus is giving and receiving information about video game development. This reflects the non-technological nature of non-electronic game development and publishing, and the highly technological nature of video game publishing. Non-electronic games is a much smaller industry than video games, even though we can point to one freelance designer who makes over a million dollars a year (Reiner Knizia) and one huge American company (Hasbro and its subsidiaries) along with some very large German companies. Yet one of the larger American companies, Fantasy Flight Games, has smaller annual revenues than the budget of many AAA list video games. As a consumer-oriented affair, Origins charges just $60 for up to five days (and free to teachers), though playing in many of the games and attending the historical seminars is an additional cost per event. Game playing at Origins fall into categories, boardgames, role-playing games (including "LARP", live action role-playing), collectible card games, and miniatures games. There are also seminars at Origins, many about history, many about games. TGC was $100 per day, $25 per day to students, for a two day meeting. Origins also has a $10 ticket for people who just want to go through the vendor hall and art show. I can't say how much deal-making might occur at a conference such as TGC, but one of the reasons for a professional designer to attend Origins is to talk with, and perhaps demo a game to, publishers. I personally don't feel a need to travel 500 miles just to play games, but evidently many people do. Origins is also more celebrity-oriented than TGC. There are several guests of honor who conduct events during the week, and the venerable "Origins Awards" are voted on and awarded to the best games in various categories. Yet there's very little of the "rock star" or hero worship I've heard happens at GDC, but which I did not see at TGC. There are smaller conferences comparable in size to TGC, such as the six day World Boardgaming Championships in Lancaster, PA (1,500 attendees) and four-day PrezCon in Charlottesville, VA (4-500). Families often attend these events. These affairs are even more consumer-oriented in the form of organized tournaments, with few seminars and not many vendors. The tournaments are for bragging rights only (plaques awarded for best players) rather than prize money; there are also team competitions and other competition-oriented features. An award is given to best tournament referee ("GM"). There are about 125 tournaments at WBC, in both board and card games (most of them extending over several days). 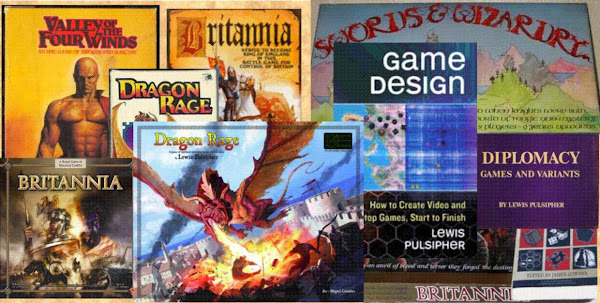 These can vary from simple games like "Liar's Dice" to big 4-5 hour contests such as my game "Britannia," to epics that take 6 hours and more to play (e.g. Advanced Civilization--the boardgame that preceded the computer game). Both conventions are board and card game oriented, with virtually no RPGs or CCGs. In the unlikely event that video game production comes to use standardized methods, perhaps the conferences will become more consumer-oriented. Some people play games like some people "sound bathe", that is, have music playing but don't really pay attention, don't really LISTEN. They're not particularly interested in exactly what they're doing, and they're not putting much effort into it. In many Euro-style games (and let's realize that this is such a large category that there are always many exceptions to any generalization), players WANT just a few choices, and then the play of the game revolves around which choice to make. The "best" choice depends on the situation, and the better players recognize which is the best choice in given circumstances, though generally there is no choice that will always work out best in a given situation. In other games, including many "old" games and some of the new ones, there are many choices, and one of the skills is seeing all the possibly-good choices in a situation. Better players will not only see those additional choices, they may be skilled in influencing the course of the game so that those choices are available when they next play. A sure way to spot this point of view is the gamer who plays a game once, then criticizes it for poor play balance or too few choices. While the game may indeed have those characteristics, it can also be the case that the player has assumed he's recognized all the choices, and all the balance possibilities, the first time he played. I recall a young player at the WBC Britannia tournament (his first Brit game) who, when he finished, said he couldn't see how he could have done anything differently (no, he wasn't near winning). It was only after some expert players talked with him a while that he realized there were large choices he hadn't seen, and also, that even small choices made a difference in the long term. Perhaps he wasn't accustomed to games that did not reveal the choices immediately. "It's important but I haven't figured it out yet." "I haven't even realized it's important." So the expectation in those Euros that are essentially "family games on steroids" is that the first is the typical situation after one play, yet in many strategy games there will be a strong element of the second after one play. Perhaps this is a reason (not a sufficient reason or necessary reason) why there is the emphasis on multiple ways to win in Euro games: so that the players will easily see at least one way to win at first playing. I'll take an example from my own experience. Here's a comment I ran across about Britannia. "Innovative, but only interesting once. After that, it's just rolling dice for 6 long hours, very boring. Green is horrible. Purple is a one shot wonder also." Here's a person who thinks he can see all possible strategies the first time he plays a game. Is that because he plays simple (shallow?) games? This player clearly didn't have a clue about many of the strategies in the game. I'm curious if he wondered what the people who've played 500 times were doing? I suppose he didn't know how intensely the game is played, how (as Tom Vasel says in his review, it "may satisfy the itch in players looking for a deeper encounter, an epic game that is all about the experience."). Rather than consider the possibility that he'd missed something, the commenter dismissed the game. (Btw, there are lots of perfectly reasonable reasons why some people do not like Britannia, e.g. the length, the dice rolling, the "scripting", the need to plan well ahead. Poor play balance is not one of them, clearly.) This is the kind of comment I'd expect from a "shallow" player, perhaps someone who plays shallow games, though maybe just someone who doesn't easily see strategic possibilities in this kind of game. I'm afraid there are a great many players of this kind nowadays, which may be one reason so many games are only played a few times: either they are shallow, so there isn't much there, or the "shallow" player isn't going to play any game many times because either he gets it easily and exhausts the possibilities, or he doesn't get it at all. Is this "bad?" I suppose that's a matter of opinion. Designers need to recognize it, in any case. When it comes down to it, should a designer in playtest stages do what he wants with the rules of play, or what the playtesters recommend? Or what works out for the players in play, which may be a little different than the recommendations he gets? I believe I'm very receptive to what players suggest (or what I see that they would prefer, as they play). If people take the time to play my game, I ought to be receptive, else why bother? I think playtesters may be more likely to offer suggestions if they know the designer is receptive to them. I'll contrast this with, say, Microsoft's attitude that they really do know what's best for people, even when people say otherwise. I'm sure they often ignore the computer equivalent of playtesting input. The original huge controller for the XBox is a famous case. So is that Paperclip help in Microsoft Office that drove so many computer users right up the wall--they finally stopped making it the default. I'll say this: if you're not willing to change your non-electronic game, you're more likely to end up with a "developer" who will change it as he likes regardless of your preferences. Video game designers tend to say "I know what people will like". Non-electronic game designers tend to say "maybe people will like this, let's see." A harsh person might say that this the difference between the person who thinks he knows and the one who recognizes that wisdom comes from knowing what you do not know. More likely, though, it's a matter of necessity, the video game designer must plan all the details of the game before there's a game to play; the non-electronic game designer can make a playable prototype while still hazy about many of the details. Origins says over ten thousand gaming enthusiasts enjoyed the 2009 show, down 18% from 2008. 2008 was itself a down year owing to very high gas prices; the previous year the count was around 15,000. (This is unique attendees, if someone is there five days he counts as one attendee.) Day-pass tickets (instituted in 2008) were up 16%; the total includes those folks. So in contrast, 2007, which did not have the inexpensive day pass, approaches double the attendance of 2009! They also say "more vendors"; whether that is in comparison only to 2008 I don't know. But I am sure that the square footage is way down from 2006-2007. I recently played the Diceless Barbaria prototype solo, as well as several scenarios of Frankia (also diceless). I used to try to play early prototypes as though each nation was independent. I wanted to see what were the most natural moves for each, and try to arrange the game so that the most natural moves matched what they did historically. But I found that this didn't work out when the influence of colors was introduced. So now I always keep in mind the colors I've selected. I still want the most natural play to be the one made historically, but I have to be aware of how an unnatural play by one nation may help another so much that the game will be skewed. I'm not really worrying about how strong the nations were historically, I'm worrying about how strong (or weak) they need to be to make their most natural moves match history. I know that in any game, unless I put a real straitjacket around the player, as in many of the SPI games from back when, the game is rarely going to follow history. What I want is one where I can say, after a player has moved, "yes, that's just what they did historically". I am striving for effect, largely, relying on cause only in the very largest sense--because designing games for cause is a chimera (barring, perhaps, highly-detailed tactical games where you use made-up scenarios rather than known historical battles). In Frankia, which is a fairly small game (around 30 pieces on the board at any time), I have taken to counting pieces of each color, and areas occupied, after each turn. I'm trying to be aware of what it would be like to play a color: are there times when a color has few pieces and little to do? Sometimes there's nothing I can do about that (as when yellow in Britannia have only the Scots and R-Bs), but I can try to avoid it as I try different nation combinations. I was at my sixth consecutive Origins Game Fair last week, and I have to say that it has "diminished". Where it really hit was in the lack of exhibitors and apparent lack of attendees. The auction appeared to be in a smaller area with fewer items and fewer bidders, but that's hard to judge. Smaller booths for companies, or no booths at all for hobby game mainstays (Days of Wonder, GMT), were the order of the day. I was told GAMA raised the booth prices, but other folks didn't seem to think that was a sufficient explanation. Matrix Games, the makers of electronic wargames, were not there. Those "Really Big Show" booths that used to dominate the floor from WotC, WizKids, AEG, and so on were all gone. The aisles were all wide, the area at the end of the hall where the larping practice took place was even larger than in past years. We still had the slightly pathetic little booths of self-publishers who have one or two games and were trying to drum up interest. They usually find it isn't worth the cost, and aren't back the next year, replaced with another set. I admire their moxie, but maybe not their business sense. FantasyFlightGames was there but no Britannia copies were in sight (they could have sold out, they had two days before I got there). The economy is clearly part of the effect. Avalanche had a booth but sent only one person instead of three. The attendance seemed to be down, and certainly judging from attendance at seminars, there were fewer people at Origins this year. (Official attendance may look better because this is the second year for the $10 ticket that is only for the exhibits and such.) I talked with someone who'd just been to an engineers conference where attendance was 40-60%, and he said others there had told a similar story about other conferences. Who knows what it will be like next year? I expect the recovery from this debt-based recession to be very slow and limited, as we're not willing to stop going further into debt as a country. The usual Chinese companies trying to drum up business manufacturing game parts seemed to be missing. Someone told me that the minimum order from China had risen from $5,000 to 10,000 PIECES of an item. Though I talked with someone else who had found a Chinese producer of nice plastic parts willing to make just 2,000 of each. Some companies are doing well. Decision Games is growing in their magazine production. "Strategy & Tactics" has a 15-20K circulation altogether, more without the game. They emphasize analytical articles and maps maps maps. But their "Fire & Movement" magazine was not mentioned in the Decision Games update, so it may be that magazines about games rather than about history aren't doing well. Attendance at Monte Cook's seminars--admittedly, they weren't in the convention book, but were listed on easels in main thoroughfares--was quite low, considering how well-known he is in RPGdom (wrote the 3rd Edition Dungeonmasters Guide, among many others). Attendance at my seminars was way down from the past two years. I have always disliked the money aspects of Orgins: you pay extra to play games, even open gaming! You pay extra for a lot of the seminars ("Origins War College"). Mine are free, btw. WBC is a MUCH, MUCH more friendly environment for game playing, but as it's limited to boardgames (which are a stepchild at Origins, I think), the minis guys and CCGs types and RPGers aren't at WBC and probably wouldn't be welcomed in large numbers. There wasn't much opportunity for business from my point of view, and I'm not sure I'll attend next year. This originally appeared a couple years ago in "Against the Odds" magazine.